Laser technology is becoming quite commonplace in a wide variety of areas throughout the healthcare industry; but did you know that it can now be used to detect tooth decay? Today, using a small, handheld device, it is possible to detect tooth decay that is not yet visible and would otherwise be undiagnosed by conventional methods alone. 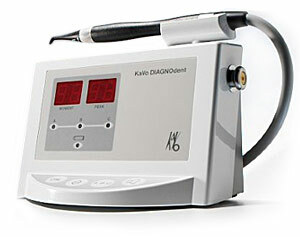 Using this noninvasive technology, your teeth are scanned to examine their structure. Laser cavity detection is based on the fact that healthy tooth structure reflects light, or “fluoresces,” differently than does decayed tooth structure. Healthy teeth will have little-to-no fluorescence while teeth with decay display with a higher level of fluorescence. And the higher the fluorescence, the more advanced the tooth decay. Once the scan is complete, the fluorescence readings are converted into a digital numeric output. You will also “hear” when you have decay present, as changes in fluorescence and numeric value are emitted as an audio signal that goes up in tone as it denotes the presence of decay. Tooth decay may be more difficult to detect today than it was in the past. Why? It's probably due in part to improved oral hygiene, and, ironically, the increased use of fluoride in toothpaste and in tap water. While fluoride has proven invaluable at protecting teeth by hardening their outer enamel surface, that increased hardness can sometimes conceal even aggressive decay. As a result, tooth decay can be difficult to find, even with the use of traditional x-rays. Furthermore, prior to using a laser scanner, dentists depended upon x-rays and using fine picks to identify cavities. 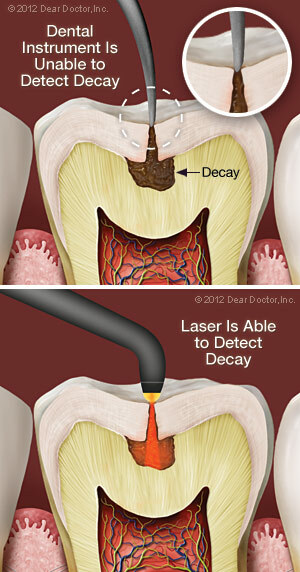 However, using laser technology provides about a 90% accuracy rate for identifying suspicious areas and cavities. This translates to earlier detection, less tooth structure loss resulting in stronger teeth, less time spent in the dental chair, and, ultimately, a financial savings to you.